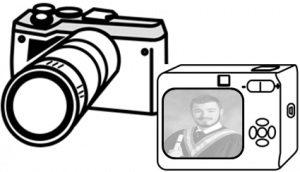 Digital photography tips can help students when taking portraiture photos. Today, teens love to take selfies. They understand how to position the camera, adjust their facial expression, and pose to capture the perfect image – of themselves. However, taking photographs of others requires different techniques. Share these 8 practical portraiture digital photography tips with students. They can use them to create original images for school publications, take yearbook photos, or capture unforgettable moments in their friends’ or family members’ lives. Select a background that does not distract from the person in the foreground. If the location is too busy, consider taking the photo in a new place. Have the person try different poses to find one that looks the best. Often slight changes, such as tilting the chin up or down can dramatically change the pose. If you want to take a candid picture, have the person do something they like doing in a place where they will feel relaxed. The person you are photographing needs to be relaxed. Consider taking some practice shots just to warm up and give your model some time to relax. Talk to the person being photographed about what action or emotion you would like them to show. Stand up, crouch down, or move to the left or right to get an angle that makes the model look great. Use the zoom feature to fill the viewfinder with the person. If there is too much background in the shot, the person will not stand out. Have interesting accessories on hand to add a splash of color or change the mood. Do you need activities to introduce digital photography to your middle or high school students? TechnoPhotoshop, published by TechnoKids Inc., is a technology project that has practical tips for capturing digital photos. Assignments have students explore the elements of design when using a digital camera. Moreover, there are useful hints for taking landscape, portraits, still life, and sports photography. As well, there are instructions on how to use Photoshop tools to enhance photo quality.